Arjelo Miso is a team leader for teachers with the Samaritan’s Purse values classes. 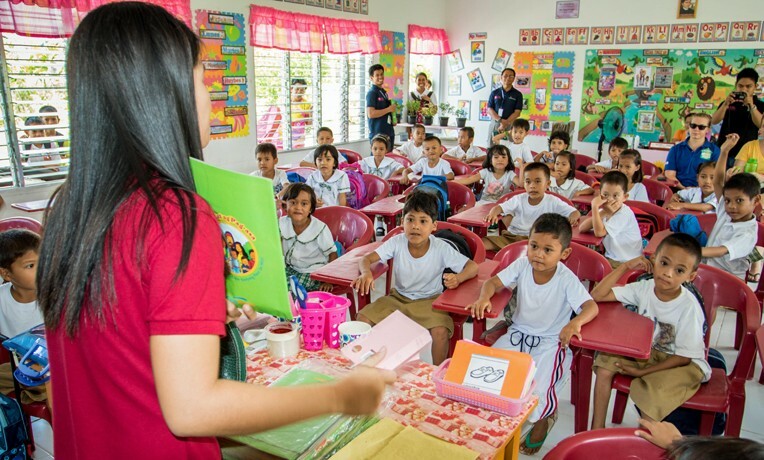 Editor’s Note: The values class program was launched in the Philippines in 2015 to reach 145 elementary schools in Typhoon Haiyan-affected areas. The teachers have taught 30-minute Bible lessons each week to more than 15,000 students. What would happen if Jesus taught in today’s generation, especially to elementary-age youth? Would the kids listen attentively? This was a thought I had while teaching a values class at Capilla Elementary School in Pastrana, Leyte, Philippines. As team leader, I’m assigned to Santa Fe and Pastrana, two towns with 39 elementary schools. My team includes seven other teachers who cover all the schools with me. When the program started, it was a challenge for me travel to reach all the schools, but I eventually got used to it. From time to time during the week, I will visit all seven teachers to check on them and observe how they teach. I often got tired with so much travel. I always prayed that God would grant me joy and strength when I teach, but sometimes I wondered if He heard my prayers. One day, while I was on the way to Maricum Elementary School in Pastrana, I was contemplating my struggles and searching for answers. When I arrived at the school, even though the students were enjoying their snacks, I could hear them scream, “Titser Arjelo, yehey adi na he titser Arjelo!” (“Teacher Arjelo, yay, teacher Arjelo is here!”). I saw their big smiles and felt their joy as they ran toward me and gave big hugs. By their reaction, I could see that God answers my prayers in every occasion, especially when teaching values to students. It was indeed a remarkable experience, to know that God heard my prayers and showed me the answers I was searching for through the excitement and love of the students. I’m so blessed to be part of the Samaritan’s Purse values class teaching force in the Philippines.